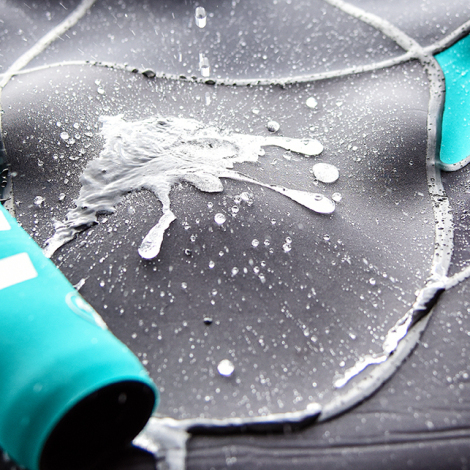 First and foremost, Ride Engine is not going to “greenwash” our Neoprene story. 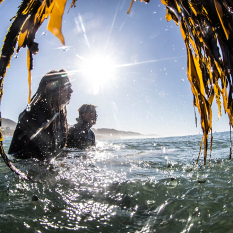 We are realistic in the notion that it is impossible to build action sports gear without impacting the environment in a negative way, and wetsuits are no exception to this. Although we cannot eliminate the environmental impacts of their construction, we can forge ahead with a genuine commitment to minimizing them as much as possible. In short, Neoprene is a foamed synthetic rubber compound, called polymer polychlorprene, developed by DuPont the 1930s and now used the world over in a wide variety of applications. 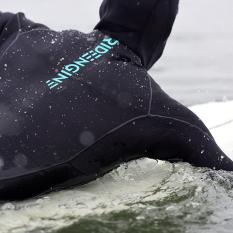 Neoprene is created through a chemical process- called free-radical polymerization of chloroprene- where liquid compounds are combined in a way that changes their chemical structure to longer, polymer strands. 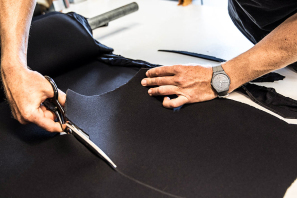 This process yields polychlorprene chips, which are then melted together and combined with foaming agents and other compounds, then cured, baked, sliced to desired thickness and finally laminated to nylon or other fabric to form what we commonly know as Neoprene fabric. Petroleum-based neoprene generally uses butadine, an oil derivative, as the compound that essentially acts to bind chloroprene together to create longer chains of repeating molecules- a process called polymerization. This process results in the polychlorprene chips used as the basis for neoprene. Limestone neoprene is made in much the same way, except that the critical binding agent (called a monmer) used in the process is derived from limestone rather than petroleum. Limestone vs. Petroleum: Both require energy and natural resource consumption, but at Ride Engine we believe the impacts associated with petroleum extraction, transport and refinement are far worse. Limestone is a finite resource that requires energy and fossil fuel to extract from the earth. The process of turning stone into the compound needed to produce neoprene requires no small amount of heat and energy as well. While this is certainly not environmentally friendly, when comparing it to the enormous environmental costs, impacts and dangers associated with the oil industry, we are confident in saying it is by far the lesser of the two evils. This is where limestone neoprene really stands out. In short, limestone-based neoprene is more effective, more comfortable and longer lasting than its petroleum counterpart. On a chemical level, limestone-based neoprene differs from petroleum in that it has higher-density closed cell structure. These closed cells are essentially air bubbles packed tightly together within the chemical structure of the neoprene. 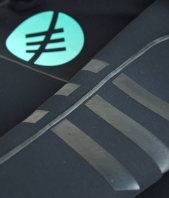 There are several functional benefits of this, including increased elasticity and durability, decreased weight and water absorption and improved heat retention- all important factors in a high-quality suit. We can’t label either material “environmentally friendly”, but we can say without a doubt that limestone-based neoprene is by far the superior material. As a brand, we’re more comfortable with the impacts associated with limestone than with petroleum, and the fact that the end result is a higher-quality and longer-lasting product makes limestone the clear winner.